"The duality of the puppet--which oscillates between a vibrant being and inanimate object--has afforded theater artists and scholars a rich legacy of philosophical criticism and commentary. Adding to this scholarship, Bell (Univ. of Connecticut), Orenstein (Hunter, CUNY), and Posner (Northwestern) have assembled 28 essays written by noted scholars, theorists, and performers (some contributors fulfilling several roles) to reexamine traditional definitions of puppetry in light of contemporary performance… The essays examine puppetry practices of 15 countries and include 66 illustrations in all, making this volume a significant corpus of new English language puppetry scholarship…Summing Up: Recommended." "This is a marvelous collection of essays testifying to the growing importance and richness of historical, critical and theoretical writings being produced today on the fascinating world of puppets and performing objects." 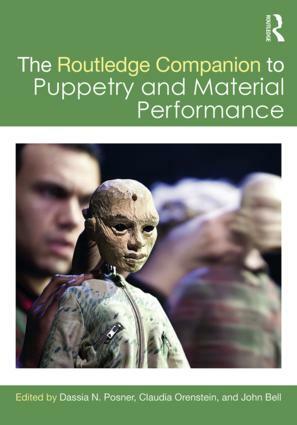 "The Routledge Companion to Puppetry and Material Performance is a landmark in puppetry studies. Its collection of articles is remarkably wide-ranging and up to date, with writing that is scholarly but uniformly accessible to any reader with an interest in puppetry. It is an essential book." "This is a much awaited book that guides the reader intelligently and engagingly through the recent discourse on puppetry and material performance with its myriad of new terms. Comprehensive in its reach, the book includes investigations into the traditional, modern and hybrid manifestations of performing objects as well as analyses from philosophical and practice-based perspectives." "The Routledge Companion to Puppetry and Material Performance features a lively range of approaches to puppetry in theory and practice. It will be an indispensable resource for material performance studies." "This Companion gives platform to the thinkers of our day in their search for an articulation to our truly unruly art form. The vitality audiences have seen on our puppet stages in the recent decades is dynamically revealed here in vibrant thought and discourse." "I cannot speak highly enough of this book. Not only does it bring extra rigour to the study and analysis of its subject, but it also manages to be an enjoyable read." "This is a brilliantly conceived, meticulously edited volume that could easily become the cornerstone of an entire course of study (either undergraduate or graduate) and a foundation text for the entire field." "From wayang to War Horse, the chapters in this collection provide evocative theories, history, and accounts of practice surrounding puppetry and object performance around the world. It is impossible to deny the ever-growing popularity of puppetry, and this book offers a much-needed overview and provides an excellent springboard for further study and research. Every theatre scholar and practitioner should get a copy!" The editors have succeeded in making a case for the field of material performance to be considered alongside other performance fields… This collection proves that not only is puppetry ubiquitous in our material world, but that there is invigorating material performance work happening today that merits discussion. John Bell is Director of the Ballard Institute and Museum of Puppetry and Associate Professor of Dramatic Arts at the University of Connecticut. An active puppeteer with Great Small Works and Bread & Puppet Theater, as well as a theatre historian, his publications include American Puppet Modernism (2008) and Puppets, Masks, and Performing Objects (2001).